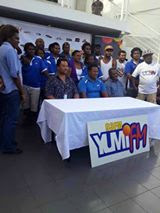 The 12th Yumi FM Digicel PNG Music Awards is just three weeks away and preparations are underway for the big night. We are pleased to announce some of the artists who will perform at the awards night, Demas Saul, Wah Koo Boys, Tavin Toune, Sean Rii and female artist Sink Lane. The music awards also bring to mind one other thing that is an issue with artists and that is artist royalty, something PNG FM is doing its bit to help the artists whose songs play on air on the three radio stations. Senior Program Director for all the stations Shaz, said PNG FM under Nau FM, Yumi FM and Legend FM, is very proud to be part of the Australasian Performing Rights Association (APRA) that recognises artist works. To enjoy this benefit artists’ must sign up to APRA and the good thing about APRA is if artists sign up now and their songs have been playing for five years, they get back- dated pay for that.